We’d love your help. Let us know what’s wrong with this preview of Super Jake & the King of Chaos by Naomi Milliner. When life revolves around stressed-out parents and ER visits for his special needs little brother Jake, eleven-year-old Ethan escapes to a world of top hats, trick decks, and magic wands. When he hears A debut contemporary novel about 11-year-old aspiring magician Ethan, who discovers that heroes come in all sizes, and real magic can be found in the most unexpected places. To ask other readers questions about Super Jake & the King of Chaos, please sign up. Naomi, what was the inspiration behind your book? This one certainly does. What I love most about it is that one of its central characters is a baby. Who doesn’t even talk. He is important to everyone in the story, especially the narrator who would do anything for h If every Middle Grade book was as heart-warming, realistic and interesting as this one, I can tell you I would be reading them more often than once/twice a month. It’s pathetic really because I love the genre, I’m so happy it exists, but many simply don’t appeal to an older audience. I LOVE THIS BOOK! I defy you to read it without laughing, crying, or cry-laughing. This is an absolute must-read. Warm, funny, relatable, and heartfelt with unforgettable characters that you will want to take home with you. On top of that, it's beautifully written and will have you turning pages quickly to find out what happens. SUPER JAKE & THE KING OF CHAOS is a wonderful story that will have you laughing and crying and laughing and crying. Ethan, an 11-year-old magician, is the humorous and tender-hearted narrator of the story. He has a first-grade brother, Freddy, full of energy and fun, and a sweet 2-year-old brother Jake. Due to brain damage, Jake is unable to speak or sit or reach out, and he requires a lot of the boys' parents' attention. Ethan loves his brothers, but he wishes sometimes that his magic was r SUPER JAKE & THE KING OF CHAOS is a wonderful story that will have you laughing and crying and laughing and crying. Ethan, an 11-year-old magician, is the humorous and tender-hearted narrator of the story. He has a first-grade brother, Freddy, full of energy and fun, and a sweet 2-year-old brother Jake. Due to brain damage, Jake is unable to speak or sit or reach out, and he requires a lot of the boys' parents' attention. Ethan loves his brothers, but he wishes sometimes that his magic was real. He wishes his magic could help Jake. This is such a touching and heartwarming MG novel. I love Ethan, the main character, and his humor and heart. The family dynamics are so loving, and Jake's journey is a tearjerker! If you're looking for a good, wholesome – and, yes, again, heartwarming – story, then get yourself a copy of Super Jake & The King of Chaos! Make sure to read it with a box of tissues! It's not often that a book can make me both laugh and cry at the same time, but this one did it! Ethan was funny and sincere, but not sappy or unrealistic. My heart ached for him as he tried to be the strong big brother, holding it all together with a brave face while he worried that everything might fall apart. "... every once in a while, if you're fortunate, you get to be a part of real magic." Super Jake is absolutely magical! This book is the perfect balance between heartwarming, uplifting, and heavy, which is a perfect mix for its middle grade audience. Ethan and his family will stick with me for a while. I loved this heartwarming story so much!!! Ethan’s devotion and love for his brothers just melted my heart. The whole family was incredible and were so easy to root for.I felt so many varied emotions from sentence to sentence and I was so sad to finish. I wanted to read more about this wonderful family and their connection to each other. Highly recommend!!!! Naomi Milliner's debut novel is based on her own family, and the authenticity of her experience shines from every page. Eleven-year-old Ethan yearns to perform magic tricks and meet his hero Magnus the Magnificent, but family life is complicated: He has an adoring first grade brother Freddy and a baby brother, Jake, who is brain damaged and can't speak or move much. Jake requires nearly round the clock care, along with a small army of therapists and helpers, and a big chunk of the parental atten Naomi Milliner's debut novel is based on her own family, and the authenticity of her experience shines from every page. Eleven-year-old Ethan yearns to perform magic tricks and meet his hero Magnus the Magnificent, but family life is complicated: He has an adoring first grade brother Freddy and a baby brother, Jake, who is brain damaged and can't speak or move much. Jake requires nearly round the clock care, along with a small army of therapists and helpers, and a big chunk of the parental attention. While many middle grade books deal with family trauma and dysfunction, Super Jake stands out as a story of a family that remains whole and deeply loving despite trials and setbacks, some of them life-threatening. We ache with Ethan when he doesn't get all the attention he needs because of the daily routines of tending to Jake, but Ethan never loses his kindness, hope, and spirit. He's a *nice*, big-hearted kid in a *nice* big-hearted family, and that foundation gives him the resilience to grow and learn. One of the most important lessons Ethan learns is that there are all kinds of magic. The real magic of consideration, love, and generosity makes meaning in life well beyond card tricks and slights of hand. Sometimes the dreams we have are not the dreams we need. This lovely, necessary, and heartfelt story is an important one not only for young people growing up in families with special needs kids, but to foster understanding and empathy in all readers. Bonus: Whoop! Five of the magic tricks Ethan performs in the course of the book are explained with instructions at the end. I expect kids will love this! This book will give you the feels. I love the dynamics between the brothers, and young readers will definitely enjoy all the magic tricks, too! Devoured this one, laughing, crying, and cheering throughout. Every kid needs to read this story to help them see what really defines a hero. Excellent in every way. Thank you to the author and to Hatchette Book Group for sharing this wonderful work with my #bookexpedition reading group. This was awesome. Like, really really awesome. The main character is Ethan, a kid magician, who performs his act at kid parties and the like. He wants to enter a junior magicial contest where the winner meets a famous magician who happens to be his hero, but life gets in the way. Between earning money to pay for the trip, keeping up his grades, and, most importantly, helping care for his little brother (Jake) who has suffered from some developmental issues since birth, Ethan has got his hands fu This was awesome. Like, really really awesome. The main character is Ethan, a kid magician, who performs his act at kid parties and the like. He wants to enter a junior magicial contest where the winner meets a famous magician who happens to be his hero, but life gets in the way. Between earning money to pay for the trip, keeping up his grades, and, most importantly, helping care for his little brother (Jake) who has suffered from some developmental issues since birth, Ethan has got his hands full. What is particularly wonderful about this story is the way the author weaves in Jake's struggles and their impact on the family in a natural way. Jake's family is full of love, and each family member has their own special relationship with Jake. Therapists, doctors, and neighbors are present as well, offering a glimpse into the very realistic way everyone comes together to care and love a special boy. I really enjoyed the relationship Jake has with both of his big brothers: Ethan and Freddy. It's done so well, and never in a heavy handed or preachy way. Plus, the magician competition is nearly always at the forefront, moving the plot along at a very nice pace. This is a truly magical story about an eleven-year-old boy named Ethan who is quite the budding magician. Ethan performs for birthday parties and practices his act every chance he gets, even when he probably should be working on homework or helping with his brother. Ethan learns of a magic festival where he could enter a junior magician contest with the winner getting to meet Magnus the Magnificent his idol! He is beyond excited, he just has to convince his family. Ethan’s youngest brother Jake ha This is a truly magical story about an eleven-year-old boy named Ethan who is quite the budding magician. Ethan performs for birthday parties and practices his act every chance he gets, even when he probably should be working on homework or helping with his brother. Ethan’s youngest brother Jake has severe brain damage which requires lots of extra attention and he is constantly in and out of the emergency rooms. With the contest approaching Ethan has a hard time staying focused on magic as he worries for the health of his baby brother. Milliner’s tale of Ethan, an 11-year-old magician, and his brothers, Jake and Freddy, is a page-turner from the very beginning. Ethan took up magic after his youngest brother, Jake, suffered complications when he was born. Ethan wants nothing more than to meet his favorite magician in Atlantic City, but that means having to bring his grades up, help around the house, and earn two-thirds of the money himself. Selling his services at birthday services helps earn money, he likes helping Jake and re Milliner’s tale of Ethan, an 11-year-old magician, and his brothers, Jake and Freddy, is a page-turner from the very beginning. Ethan took up magic after his youngest brother, Jake, suffered complications when he was born. Ethan wants nothing more than to meet his favorite magician in Atlantic City, but that means having to bring his grades up, help around the house, and earn two-thirds of the money himself. Selling his services at birthday services helps earn money, he likes helping Jake and really worries more than his parents realize, but bringing up his grades is made difficult when Ned moves to town. The journey to Atlantic City is complicated, but with a little growing up, and a lot of understanding, it seems that he may finally get to meet his hero. But life has a little more to teach him first. Milliner’s heart-warming tale of family, friends, support, and putting things into perspective will leave you laughing, crying, and cheering. Eleven–year-old Ethan loves magic and dreams of going to a magic competition to meet his idol. Fiercely protective of his severely brain damaged little brother, Jake, Ethan does everything he can to make him smile, and hopes for the day he might actually hear a laugh. But when a bully goes after Ethan’s little brother, Ethan has to choose between keeping the peace to attend the magic show, or standing up for his brother which might lose him the chance of a lifetime. This book touches on working hard to master a skill, saving money for a goal, bullying, correct ways to interact with people with special needs, friendship, loyalty, and the importance of family. Naomi Milliner’s debut is perfect for the classroom or a family-friendly read. I highly recommend Super Jake & the King of Chaos. "I am stone, like Merlin. I am trapped, like Jake. There are so many things he'll probably never do, but he smiles anyway--even all those times I let him down and don't stretch him. Even when I said I did...but I didn't." Just. Wow. This beautifully written debut novel by Naomi Milliner is hilarious yet heartwarming. Milliner expertly writes the feelings of an 11 year old boy in an engaging and authentic way. Ethan's lo I received a copy of this book from netgalley in exchange for an honest review. Just. Wow. This beautifully written debut novel by Naomi Milliner is hilarious yet heartwarming. Milliner expertly writes the feelings of an 11 year old boy in an engaging and authentic way. Ethan's love for magic is only rivaled by his love for his brothers. And his story is well worth reading. The complex relationships and engaging plot create a powerful and moving read that will stay with me for days to come. Thank you so much to the author and Running Press Books for sharing a copy of this amazing book with our #bookexpedition group! Ethan loves magic. He performs at local birthday parties and works hard at perfecting his craft. But no about of magic can help his youngest brother Jake, who was born with a neurological disorder that doesn’t allow Jake to talk or move on his own. When Jake gets very sick, Ethan searches for the magic that will help his brother pull through. Not only is this a terrific Thank you so much to the author and Running Press Books for sharing a copy of this amazing book with our #bookexpedition group! This is such a beautiful story about a budding magician who learns where to find true magic. With touching family relationships, heart-wrenching challenges, and a good-hearted MC, this is a book you shouldn't miss! Based on her own family experiences, Naomi Milliner's debut is sure to become a classic. Kids and adults alike are certain to love this touching story. I love debut novels! This book was wonderful! Encouraging and uplifting! Perfect for the targeted audience and hits on a "Special" subject! Enjoyed everything about this book! Highly recommended read! Thank you netgalley for the free arc in exchange for an honest review! This book will give you the feels! If you want a book that really tugs the heartstrings, this is one of those books. The main character and his family leap off the page so the reader experiences every setback and triumph along with them. Great read! Super Jake and The King of Chaos is a wonderful book about a boy who truly loves his family. This is what really stuck out for me--there is so much "real" family connection in this book, and it felt so genuine and intimate. Ethan's voice is so unique, and I found myself laughing and crying in the same paragraph as he navigates his love for his complex family, his desire to compete in a magic competition, and the sacrifices he has to make even at such a young age to make it all happen. Super Jake is such a hilarious and heartwarming story, and it's a great one for a family read aloud. My name is Ethan, and I have a chance to meet my hero Magnus the Magnificent! All I need to do is travel to Atlantic City and win my age category at the Magic Fest. I think my act is good, but is it good enough? I like practicing at home with my little brother Jake. He's confined to a wheelchair and can't speak, and his health can get seriously bad due to changes in his body temperature. Anyhow, things were going great until Ned arrived at school. We don't get along even though our mothers went My name is Ethan, and I have a chance to meet my hero Magnus the Magnificent! All I need to do is travel to Atlantic City and win my age category at the Magic Fest. I think my act is good, but is it good enough? I like practicing at home with my little brother Jake. He's confined to a wheelchair and can't speak, and his health can get seriously bad due to changes in his body temperature. Anyhow, things were going great until Ned arrived at school. We don't get along even though our mothers went to college together, but then he crossed the line. He called my brother a retard, and I lost it. There's no way I'm going to apologize for what I did, so Magic Fest is off. I mean, I shouldn't need to say I'm sorry for protecting my brother, right? I thought magic was the most important thing in my life until the day I received some horrifying news. I don't know what to do. This review has been hidden because it contains spoilers. To view it, click here. Ethan, an 11 year old magic aficionado, has a lot of stress in his life. His brother has special needs that can lead to swift changes in his condition, he has a new bully at school, and to top it off, his dad is an authority figure at his school. However when he hears his favorite magician, Magnus the Magnificent, will be performing with the winner of a junior magician completion, Ethan sees his chance to let his light shine. I really enjoyed this book in that it shows how being the sibling of a Ethan, an 11 year old magic aficionado, has a lot of stress in his life. His brother has special needs that can lead to swift changes in his condition, he has a new bully at school, and to top it off, his dad is an authority figure at his school. However when he hears his favorite magician, Magnus the Magnificent, will be performing with the winner of a junior magician completion, Ethan sees his chance to let his light shine. I really enjoyed this book in that it shows how being the sibling of a special needs kid has its challenges but it in no way diminishes the love. Ethan is always looking out for Jake, even if he feels overlooked sometimes in the process. The world needs more books with diverse characters, especially characters of various needs. It was awesome to read about Jake, how he progressed though his visits with his therapist, and the different things that had to be taken into considerations because of his limitations. The more people consider these things, the better access to accommodations can become. I would have given this book five stars, except there were two issues that I found irksome. One is that the book falls into the way played out trope that the bully is a red-haired boy. I am not hear for this. Additionally, there was a bit of “pray for a miracle” recovery and it takes away from the otherwise believability of the scenario. Despite this, it is still worth picking up for you and your kid(s) to read. Super Jake and the King of Chaos will be available May 7th from Running Press Kids. 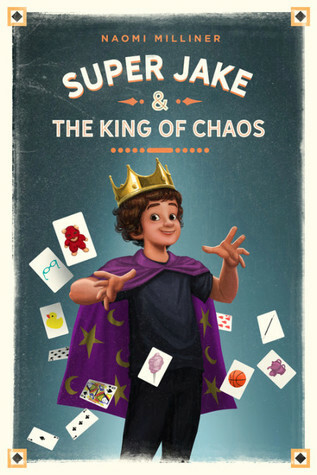 Super Jake and The King of Chaos is a book you need! I just finished this delightful, heartfelt and beautiful story which follows Ethan Miller, an aspiring magician along with his two younger brothers Freddy and Jake. Narrated by 11-year-old Ethan we soon learn about his love for magic and how one family comes together to face the challenges of having a very sick child/sibling. This book is heartwarming on so many levels--but even more so--I feel as though it’s important and impactful and will o Super Jake and The King of Chaos is a book you need! I just finished this delightful, heartfelt and beautiful story which follows Ethan Miller, an aspiring magician along with his two younger brothers Freddy and Jake. Narrated by 11-year-old Ethan we soon learn about his love for magic and how one family comes together to face the challenges of having a very sick child/sibling. This book is heartwarming on so many levels--but even more so--I feel as though it’s important and impactful and will offer young readers a new perspective on a very grown up issue. Ethan’s voice comes across as that of a bit more seasoned of an 11-year-old than average yet there are scenes that remind us he’s still very much a kid with his own hopes and dreams. I thought this was both fitting and believable given that Ethan is the eldest child in a family where one member is ill, he goes from practicing card tricks one moment to calling the doctor for his mother in the next. He is an incredible example of a big brother who stands up for what he believes in, even if it means sacrificing something he has wanted for a very long time. This story reminds us that nothing in life can be guaranteed but with the right support system and the love of a family, anything is possible. Highly recommend this charming and wonderful book! I wanted to love this book based on the description. Unfortunately, I struggled getting through the building of the story. I'd say the last third of the book redeemed it somewhat. Ethan is a wonderful character, and I appreciate how much we had to see him work through in the story, but as an adult, I was incredibly bored. I absolutely think this book is a wonderful gift idea for children around 8-10 I received a complimentary copy of this book through Netgalley in exchange for an honest review.